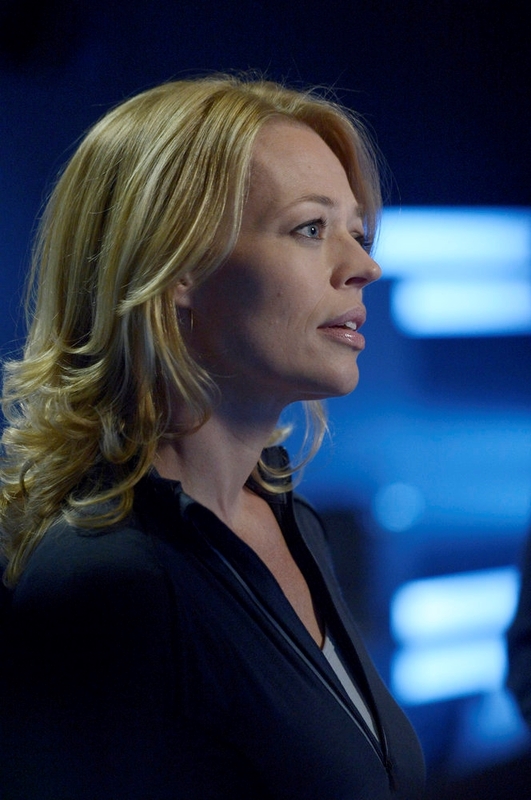 Jeri Ryan Teases Her Helix Role Interview - Are You Screening? If you aren’t watching Helix yet, you need to get on board with the Syfy spectacular. It’s absolute crazy fun, and starting tonight, Jeri Ryan is joining the show. She was available for an interview recently, along with Exec. Producer Steve Maeda, and they shared some interesting notes about her character and the show. Unfortunately, as you might guess, much of the conversation revolved around things which can’t be revealed, and the pair of them sidestepped questions with great frequency. Check it out below, and be sure to tune in Fridays at 10:00pm. The show is doing great, and it is edge of your seat intensity every step of the way. When we first see Sutton, she pretends to be this nice woman who’s there to help, and we know this isn’t true pretty quickly. Can you talk about playing the more cold, calculated side? Is there anyone that you – particularly used as inspiraton? Or, how did you become her? Jeri Ryan: No. She was just fun. This was a really fun role to play because it’s – she’s kind of out there. You know, she’s not subtle, which I love. So it was fun to just sort of let go and just really play and let her go to those places. It was – that was a treat as an actor. Steve Maeda: Yes. Sutton for us was someone who put on a very sort of benign and corporate face, which is why she does a lot of corporate speak, but then underneath there’s obviously a lot more going on, and Jeri just ate it up. It was fantastic. Jeri Ryan: Are you implying scenery chewing? Steve Maeda: No. No. It’s just awesome. Jeri Ryan: Scenery nibbling perhaps. Steve Maeda: A little nibbling. We see obviously that Julia has the silver eyes and now your character has the silver eyes. I would’ve thought that was supposed to be a result of the cure, so does that mean that possibly she’s had the virus, or is it something else entirely different that has nothing to do with the cure? Or, can you not even tell me that? Steve Maeda: You’re asking all the right questions. Jeri Ryan: Well that’s part of the mystery isn’t it? Steve Maeda: Yes. You’re asking all the right questions and answers will be forthcoming, I promise. It’s going to be answered really quickly. But, yes, those are the questions we want you to be wondering about. Jeri, I love you in this role. So, what first attracted you to it? Jeri Ryan: You know, it was fun – well the concept of the show to begin with was sort of intriguing to me. I hadn’t seen any of it at that point because it was just being shot. And, I loved you know the people that were involved in it. So that was all really cool. And then when I sort of was hearing a little bit more about the character and I was seeing how she was written, then it was fun. You know what? It’s fun. This is my sort of first foray back into sci-fi in a number of years, so it was nice. It was a lot of fun to get back into it. How much did you know about it…? Jeri Ryan: Oh, I knew very little about it because they were just shooting the season. Nothing had aired. Nobody had seen anything, so I think I was three or four days into shooting my first episode when they did the screening for the cast and crew of the pilot. Were they secretive about what was going to happen with your character? Steve Maeda: Yes. We played a little close to the vest. 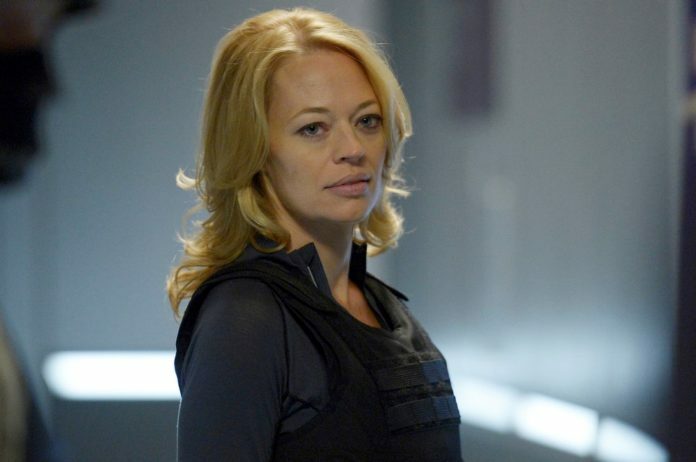 Jeri Ryan: They were holding their cards very close to the vest. Steve Maeda: And some of it we’re just trying to kind of keep the mysteries in obviously, and we’re trying to help the actors as much as we can while still not revealing everything at the end of the day. And part of it is, you know it’s a work in progress. That’s the thing about a series is you don’t have everything figured out from – you know, even the half way point. We’re still working through things. And, we knew where her character was going, but you know other things came up in the breaking of the show, so we tried to give as much direction as we possibly could. Steve, are you completely done with Season 1? Have you finished it and it’s totally out of your hands now? Steve Maeda: Not totally. We are locking our last episode, Episode 13, today, and then we are actually on the mix stage right now. We are watching a playback – a sound playback of Episode 8, which is the second episode that Jeri is in, and we’re working through those. So that’ll be going on almost until – you know, a couple weeks before we air this last episode. Jeri Ryan: Yes. I want to know that too. …is that a hint that maybe she has to keep doing that otherwise it’ll grow longer and longer? Steve Maeda: That’s absolutely the hint, and that idea I think that was something that came from Cameron’s original script. It may have actually been in the original pilot. I don’t remember, but it’s something that we always liked because it was so freaking weird. And we just had to put it in. It’s just the best, so yes; it was there originally. It was something that fell out of the pilot I think, and then we ended up finding a nice place for it. How would you best describe Constance and what motivates her? Jeri Ryan: She’s kind of a ball-buster. Steve Maeda: That’s a good question. She is a ball-buster. Jeri Ryan: I think that’s the best way to describe her, which I love. What motivates her? Well, I can’t – see, I can’t really tell you exactly what motivates her. That you sort of find out. Steve Maeda: Yes, I mean she’s – but she’s a company employee, and so I would say she is trying to be loyal to – you know, to the corporation and to the folks that she has been working with and been developing this whole plan with. And once she finds out that Hatake has since been working on his own agenda, she gets pretty damn angry about that. And it’s an interesting thing, which I though Jeri really walked that line really well, that line between the corporate kind of niceties and the polite things that you say versus the things that you actually do. And once the fangs came out, it’s all over. So it was a lot of fun to watch. Jeri Ryan: It was a lot of fun to play. And I also love, as you’ll see without trying to give too much away, she’s definitely, as Steve said, in the corporate world, and very much looking out for the best interests of Alaria, but you find out that there’s a little more personal issue for her at stake as well, which I really loved as well. Steve Maeda: We tried to do with characters even if they seem to be, both with Hatake and with Sutton, even if they seem to be very kind of on point and you know their agenda comes first, we try to infuse them with some emotion down the road so you understand where they’re coming from and it’s not just about money. It’s not just about greed or this sci-fi illness of the show, but there’s an emotional component as well. Jeri Ryan: And I love that. What was it like to work on a series that’s sometimes kind of gory and gross? Jeri Ryan: Oh, I love the gore. Are you kidding me? Oh, God, more gore. I love it. The goo and the guts, and all of it. I love it. So much fun. Come on. I observed autopsies when I was on Body of Proof. I love this stuff. I love the science of it. I love the gore. I love all of it. Do you plan to keep up this intensity or are you going to maybe let us breathe every now and then somewhere in the series? Steve Maeda: No. We want to keep up the intensity. There are light moments coming, but they tend to be kind of in the service of – it’s black humor definitely, and they tend to be in service of keeping everything moving and just sometimes you find those moments you know in the worst situations. So yes, we have 13 episodes and we really want to – our mantra was to keep the show moving, and so we want to have down time, we want to have character time, but we definitely want to keep everything twisting and turning and keep you coming back for more hopefully. Jeri, you talked about the fact that you enjoyed playing this part. Could you tell us a little bit about who this character is? How would you sort of describe this character for those people who are going to see her for the first time this week? Jeri Ryan: I’m not – trying to tiptoe the line about not giving too much away, but she’s certainly driven, and she definitely has an agenda that she is there to do. Hatake has gone off the rails. He is supposed to be finding them a virus and a cure, and he’s screwed up. He’s messing around and doing his own thing, and that’s not okay, so she’s there to fix it, and whatever she has to do to make that happen is what has to happen. Steve Maeda: Yes. She’s a fixer. She comes in and she takes care of things. And you know under the guise of corporate benevolence, she really has this very, very clear agenda and you know if Hatake has gone off the rails a little bit, Sutton has not gone off the rails of this. Firmly on the rails and is trying to make sure that everything happens the way it’s supposed to be happening and try to figure out what Hatake’s game is. Steve, what can you tell us about Ikaria? Steve Maeda: Oh, well they’re a pharmaceutical giant. They are – you know, they do good work and they make lots of drugs and they – you know, they – their public face is actually benevolent. But behind the scenes, there’s a lot more going on than what you might expect. And I can’t tell too much more than that, but the foundation of Ikaria, the origin story of – you know, and how all that happened and how the company became what it is, is something that we’re going to see over the back half of the season. How would you say playing this character compares to the character of Juliet that you played in Dark Skies? That remains one of my all time favorite shows. Jeri Ryan: Yes, that was fun. Yes. Well Juliet was much more – okay, let me say this again. Wait a minute. I got to not get myself in trouble here. Juliet was a Russian agent who worked with (Majestic). She was a little more cut and dry, her emotion. I mean she kind of hid her emotions, but she certainly had them and they were on the surface, and she was just you know a person who is doing her thing. There’s a little different situation than what we’ve got on Helix. There’s a little less – well a lot less mystery surrounding Juliet I think. How do the other characters react to Sutton’s character? Steve Maeda: Oh, gosh. I mean you know I think that they are all sort of dismayed in their own – for their own reasons because I think very quickly very early on you discover that Sutton is you know putting on a performance for the gang. And so Hatake certainly knows who she is and where she’s coming from. I think that Daniel has an idea. And I think that Alan and company learn very quickly what’s going on. So it’s – you know, what appears to be you know, “Oh, good, help is here,” is really not help at all. I mean look, she arrives with you know gun-toting soldiers too. And will this also kind of shift some of the bad guy image away from Hatake? Because so far he’s sort of seemed like our villain? Will he be teaming up with Billy and things now? Steve Maeda: Absolutely. We – one of the things we wanted to do was take our characters who seemed to be villains and try to humanize them and create some kind of unlikely pairings. And also, take our characters who seem to be you know on the side of the angles and turn them a little bit and twist them and give them some unsavory motives perhaps. And so yes, we’re trying to find those balances, and I think you’ll see them. Have either of you picked up like an unnatural fear of needles as a result of working on this show? Jeri Ryan: Oh, I’ve always been needle-phobic. Hideously needle-phobic. That’s the one thing that I have a hard time with. Steve Maeda: No, not so much. Although, you know, it certainly – the show does make you think twice about you know any time there’s a – you know, a new flu strain or anything like that. But no, not overtly I would say, but no; it’s not my favorite thing. What has been your favorite experience working on Helix? Jeri Ryan: Well I think again working with Hiro Sanada, he’s just – he’s incredible. This man is such – I mean everybody, the entire cast is fantastic, but he’s just – he’s in another world. He’s not even human. It’s crazy. Seriously, he is such a professional and he’s so dedicated, and he’s so – he’s just so good, and so connected, and so right there with you in any kind of scene. And whatever you have to do, you just – he’s amazing to act with. You just feel so supported as an actor to work with him.